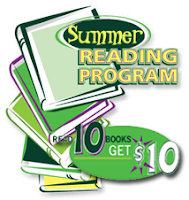 Grab $10 free money for your kids to spend this summer and reward them for reading Books at the same time! I have 4 of these accounts, one for each of my Kids! Two years ago I started an account for each of my kids for their spending money and for teaching them how a bank works, about interest, and how to save money for a future purchase. The Account is free and I used the $10 summer reading money for opening the account. I have another account for college at a different bank so this is just their money they get from doing chores. Print off the Form for TD Summer Reading Program! Take it to TD bank and start an Young Saver Account (need their SS# to do this) with the $10 or get a $10 deposit into an existing account. There is no fee or minimum balance for this account for children under 18. Then you can withdraw the cash if you would like. Bonus: Also by having a kids account at TD bank you can get Visa gift Cards without a fee! I've done this a few times also. You can get any denomination also. Valid for turn in June 1-Aug 31st!